During the summer months when I am living at our home in southern Maine, I have a really fun workout class with a number of female friends who live near me. We hold our class three days a week in the afternoon and my fitness trainer, Beth Bielat, leads the class. Beth is a triple threat, she’s not only a trainer, a mom (and grandma! ), but she’s also a black belt in Karate and what makes her so great is that she can make any workout fun! We do lots of different kinds of exercise – Beth mixes it up every week so we don’t get bored. Sometimes Beth leads us in a straight forward cardio class to awesome heart-pumping music, some days we do step training, some days we go to the gym and do a circuit on the machines, sometimes we do Tabata classes which are High Intensity Interval Training, and then some days we do Yoga and stretching and breathing classes. …But today we tried something new! The other day we had a guest instructor, Brenda Colfer. Brenda teaches at my summer camp for women Camp Reveille (Aug 21-14). She offers “Introduction to Chakras”, “Life Breath” and “Sound Healing.” But Brenda wanted us to experience a new class that she teaches called “Chakradance” in hopes that we might add it to our Camp Reveille program coming up in August! OK so let me be totally honest here… when I heard about this I was a little intimidated by the idea of letting my body “dance like a free spirit,” listening to the music and focusing on my body’s Chakras centers…. Really?! I’m going to do this in front of all the others in the class?! Won’t I look like an idiot?! 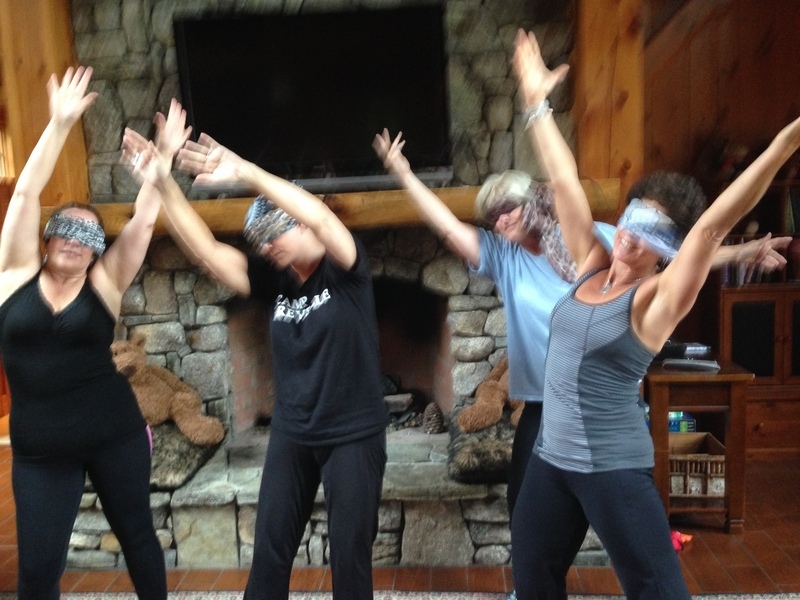 Well, guess what – Brenda pulled out a basket of silk bandanas and told us that we would tie them around our heads, doing the whole class blindfolded - Halleluiah!!!! NOW, I can’t get into this! Sure, Brenda would see me, but everyone else probably looked just as silly as I would! Chakras are the energy centers in our body in which energy flows through. Blocked energy in any of the 7 Chakras is said to lead to unhappiness and even illness, so that is why it’s important to understand this energy flow in the body and what each Chakra represents and what we can do to keep this energy flowing freely. 1. Root Chakra - Represents our foundation and that feeling of being grounded. It is located at the base of our spine in the tailbone area. It is associated with emotional issues, or survival issues such as food and money and financial independence. 2. Sacral Chakra – Represents our connection and our ability to accept others and new experiences. It is located in our lower abdomen, about 2 inches below the navel and about 2 inches in. It is associated with emotional issues such as well-being, our pleasure and our sexuality. 3. Solar Plexus Chakra – Represents our ability to be confident and in-control of our lives. It is located in our upper abdomen in the stomach area. It is associated with self-confidence, self-esteem and self-worth. 4. Heart Chaka – Represents our ability to love. It is located in the center of the chest just above the heart. It is associated with love, joy and inner peace. 5. Throat Chakra – Represents our ability to communicate. It is located in our throat. It is associated with our ability to communicate, self-expression of feelings and our ability to tell and to deal with the truth. 6. Third Eye Chakra – This represents our ability to focus on and see the big picture. It is located on our forehead, between our eyes. It is associated with imagination, intuition, wisdom, and our ability to think and make decisions. 7. Crown Chakra – This is the highest Chakra and it represents our ability to be fully connected spiritually. It is located at the very top of our head. It is associated with our inner and our outer beauty, our connection to our spirituality and our ability to experience true bliss. Chakradance is usually held in a dark room, our class was in the afternoon, but it didn’t matter, we had our blindfold on, thank goodness. Brenda said there was no right or wrong way to do this, that it was about expression and dancing for self-discovery and self-healing. OK here we go. The music was amazing; it truly seemed to capture the essence of each Chakra. The music for the first Chakra, the Root Chakra was incredibly primal. Since this is the Chakra associated with basic survival and our fight or flight response, Brenda told us to imagine ourselves dancing around a fire as natives might do in a primitive dance which was done not for social interaction like today but rather for their standing in the tribe and their personal self-worth. Many tribes had a leader who would give the calls called a shaman and today our shaman was Brenda. Could she whip up in to an emotional frenzy? As I began to move, admittedly not that much, I began to feel the floor pounding a little around me which meant that someone, or maybe all of them, were really rocking out – Oh dear I thought, am I the only one moving with such shyness? Of course the whole premise behind meditation and chakra/sound healing is about focus. It’s about pulling your focus away from all that is going on around you in your life, and quieting that little voice that talks to you all the time (and drives you crazy), and centering your focus on your inner peace and tranquility. No wonder monks live longer than us, they aren’t dwelling on the stresses in their lives, there’s a lesson to be learned. I liked listening to the primal music and imagining myself stripped of all the outward accessories that tend to define us and send signals to others, and just focus on the inner workings of my physical body. Was I centered so I was making sound intuitive decisions? I felt pretty good about that. Next, we moved on up to Sacral Chakra in our lower abdomen. DID SOMEONE SAY MY ADBOMEN – MY DIGESTIVE TRACT? Any of you who have gone through chemo know how it seems like demons take over your digestive track and are in control during your treatment period. It’s because the chemo doesn’t know the difference between bad cancer cells and good cells and kills off a lot of good cells in process. What’s happening in our bellies is actually called Mucositis, and it is a painful inflammation or ulceration of the mucous membranes anywhere along the gastrointestinal tract. It can also affect the lining of your mouth, causing inflammation and ulcerations. It can make you lose your taste and your appetite and have painful sores in your mouth. But right now we were centered on our abdomens and I was focused on trying to a belly dance, literally, like they do in countries like Morocco. My purpose was to take back control and get things working properly again. I was BIG into dancing for this Chakra. Let me now move to the heart Chakra, because it involves many of you. I don’t really remember how I was moving my body quite honestly, but I do remember how incredibly thankful I was for all of your heartfelt messages of support and prayers and simply put your love and sisterhood. I’ve been reading all of the emails and letters and tweets, but now I was experiencing them, feeling them and opening up my heart to them and it made me realize the extent to which I am not on this journey alone. I am unique in the sense that I am connected to so many people by virtue of being in the public eye, and thus being in people’s homes everyday for so many years. I feel the love and I reveled in it during this chakra. We ended with the Third Eye Chakra, being able to see the big picture; and the Crown Chakra, which is about our inner and our outer beauty and our spirituality. I would be lying to you if I didn’t tell you that when you lose your hair and you don’t really always FEEL so beautiful… it does make you focus on the you that is you without the blonde hair. I’m not saying that I run around brandishing my baldness but it’s made me rethink who is at the core of me. And all of the women connecting with me who have experienced or are experiencing the same challenging journey with me have made me have a profound new appreciation for my place in this world and how I have been able to connect with so many people. What a blessing. I think this is the Chakra that is associated with true bliss and let me tell you - I am experiencing it. I am surrounded by the most supportive husband anyone could ever ask for who constantly reminds me that he loves me know matter whether or not I have hair on my head. My older daughters have dropped everything they were doing in their lives to be with me at my doctor’s appointments and chemotherapy treatments. My younger children who are away at summer camp write me letters to see how my treatments are going. And all my other family and friends and colleagues and then all of you, couldn’t be supporting me any better. To top it all off, it has given me an opportunity to fulfill the legacy of my dad who was a cancer surgeon, killed in an airplane crash while returning from speaking at a cancer convention when I was just 14. I feel him proudly looking down and saying “Good job Joni.” True bliss… and I felt it in this new experience, Chakradance.